But almost everyone – from anti-government activists and racists to academics and historians – agrees that Ruby Ridge was a big deal, with lasting impacts. The sparks of anti-government anger that Ruby Ridge ignited in August 1992 grew much larger six months later when federal agents engaged in another siege in Waco, Texas. That event left four federal agents and 83 members of the Branch Davidian religious sect dead. Those back-to-back events, experts generally agree, fueled the anti-government movement that lingers today, erupting in occasional violence and deadly threats against law enforcement. The events in North Idaho in August 1992 became “the opening shot in what would soon become a more or less open war between the American radical right and its government,” said Mark Potok, a senior fellow at the Southern Poverty Law Center and editor of its Intelligence Report, a magazine that tracks extremism. Historian and author Michael Barkun, a professor emeritus at Syracuse University, said Ruby Ridge was of “major significance” to right-wing extremists. “It confirmed the belief that they were at war with the federal government,” he said. “In their minds, other battles were to follow, such as Waco, and with them was generated a preoccupation with movement martyrs – again, a theme for which Ruby Ridge was one of the points of origin,” Barkun said. The “one-two punch” not only helped galvanize the white supremacist movement; it also reshaped the so-called “patriot movement,” a broad group composed of various anti-government extremists, said Pitcavage, who holds a doctorate in American history from The Ohio State University. Ruby Ridge and Waco also became the “midwife” for the militia movement of the 1990s, he said. The shooting of Randy Weaver’s wife and son by federal agents “set off serious suspicions” of government agencies and law enforcement in the ranks of anti-government activists, “creating a wedge that has only widened,” Beirich said. Beyond their cultural and political impacts, Ruby Ridge and Waco taught federal law enforcement embarrassing – some would say painful – lessons. “There was a trail of serious operational mistakes that went from the mountains of northern Idaho to FBI headquarters and back out to a federal courtroom in Idaho,” Freeh said in congressional testimony. The FBI director also revamped the bureau’s “crisis response structure” and disciplined 12 FBI employees after concluding none had committed any crimes or intentional misconduct. 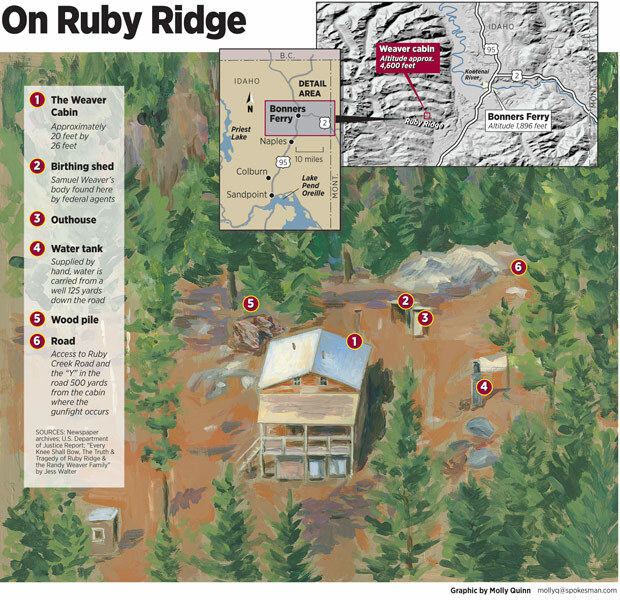 “Ruby Ridge has become synonymous with tragedy, given the deaths there of a decorated deputy U.S. marshal, a young boy, and a boy’s mother” the FBI director said. “It has also become synonymous with the exaggerated application of federal law enforcement. Both conclusions seem justified,” he said. Wayne Manis, the FBI agent who took Weaver into custody after he surrendered, ending the 1992 standoff, said many details and facts surrounding Ruby Ridge have been distorted over the years to suit various anti-government and racist agendas. Weaver initially was arrested without incident by ATF agents and was released after promising a federal judge he would voluntarily appear at future court hearings. When he didn’t, another judge issued a bench warrant for Weaver, assigning deputy U.S. marshals to re-arrest him. When one of those deputy marshals was fatally shot, the case was turned over to the FBI. The FBI, while admitting some missteps, “still took a lot of criticism that I think was unfair,” said Manis, now retired and living in North Idaho. Subsequent standoffs with anti-government extremists – including the Montana Freemen in 1996 – would see more patience on the part of agents of the FBI and the Bureau of Alcohol, Tobacco, Firearms and Explosives. “The events of Ruby Ridge, while by no means entirely the fault of the government, did not put law enforcement in a good light,” said Potok, of the Southern Poverty Law Center. “Although the tragedy did teach some important lessons, it was not until the bloodless resolution of the 1996 standoff with the Montana Freemen that American law enforcement seemed to fully absorb the notion that it is often better to proceed with tact and caution than overwhelming physical force,” he said. His colleague Beirich agreed, saying law enforcement agencies have “learned to be careful with zealots.” She cited the 12-year-old continuing standoff in Texas with John Joe Gray. Part of a growing legion of so-called “sovereign citizens,” Gray – like Weaver did in 1992 – refuses to acknowledge the authority of any government and continues to dare police to come and get him. Unlike Weaver, whose bench warrant arrest was ordered by a federal judge, Gray faces state criminal charges, and his arrest is an issue for the local elected sheriff. Grey was charged with assaulting a Texas state trooper on Christmas Eve 1999 and later jumped bail, refusing to show up in court, claiming he’s a sovereign citizen over whom the government has no control. Four sheriffs later, authorities are still waiting him out. At another standoff in 2007 in New Hampshire, Weaver – viewed as folk hero among anti-government and extremist ranks – showed up to voice his support for convicted tax protesters Ed and Elaine Brown. The pair, later arrested by federal authorities and now in prison, had voiced anti-Semitic and pro-militia views. These days, Weaver doesn’t do interviews reflecting on Ruby Ridge, according to his daughter Sara Weaver-Balter, who now lives in Kalispell. In an autographed copy of his book, “The Federal Siege at Ruby Ridge,” sold used on Amazon for 99 cents, Weaver inscribed, “Freedom at any cost!” He still sells the book at gun shows and survivalist expos. Weaver’s daughter also declined to comment about the long-term impacts of Ruby Ridge, saying she only wanted to talk about forgiveness, her conversion to Christianity and a book she’s selling. Since Ruby Ridge, federal law enforcement agencies now work closer together, mostly in regional joint terrorism task forces. For them, extremists – as evidenced by the recent mass killing in Wisconsin – still represent a real concern. So-called sovereign citizens, like the Browns, who think the government has no control over them, are now considered the No. 1 domestic terrorism threat by the FBI. A ramped-up response to the threat posed by extremists came after the 1995 Oklahoma City federal building bombing that killed 168 people. It was carried out by Timothy McVeigh, who said he was motivated by events at Ruby Ridge and Waco. The government’s response to such acts of deadly domestic terrorism has led to what some describe as a militarization of law enforcement at all levels, including federal agencies. “For American extremists, the siege at Ruby Ridge symbolizes the ‘militarized police state,’” said Daryl Johnson, a former domestic terrorism analyst for ATF and the Department of Homeland Security. Johnson is the author of a soon-to-be released book, “Right Wing Resurgence,” that addresses how, in his opinion, domestic extremist threats aren’t being taken seriously enough at the highest levels in the U.S. government. He owns a private consulting firm, DT Analytics, that monitors domestic extremist activity and provides specialized training to law enforcement. “In the minds of modern-day extremists, (Homeland Security) has enhanced the lethal capability of many underfunded, small-town police forces through its grant programs,” Johnson said. Using federal grants, state and local law enforcement agencies have been able to buy expensive equipment and training that are “commonly associated with the military,” he said. “Extremists view such a security buildup as a continuation of the Ruby Ridge legacy,” Johnson said. That legacy is a continuing drumbeat for extremists and white supremacists who recruit with the message of “big government versus the little guy” and “the government set me up,” Johnson said. In the past few weeks, various racist and white supremacy websites have mentioned the 20th anniversary, many calling Randy Weaver a hero. “While many of us have lost loved ones in this war, Mr. Weaver goes down in history as one of our best,” said one comment posted on Stormfront, considered the largest Internet hate site. “I know one White man that has tremendous respect for what the family did on Ruby Ridge,” the commenter said. Bill Morlin covered the Aryan Nations and other extremist groups during his 37-year career as a reporter with The Spokesman-Review. He continues writing about domestic terrorism as a freelance journalist, including for the Southern Poverty Law Center. He can be reached at (509) 981-0096 or at bmorlin@gmail.com.